Ruzimi Mohamed @ Mahmood, a Doctoral (PhD) student from Universiti Teknologi Malaysia (UTM) is developing an application that assists an abled person to communicate using sign language. The application is termed Bahasa Isyarat Malaysia on Augmented Reality (BIMonAR). When fully developed, the BIMonAR application will be the first application in Malaysia which provides a complete tutorial on the sign language. Its development is to assist the able-bodied people effectively learn sign language to better communicate with hearing impaired Malaysians. Ruzimi is developing the BIMonAR application at his home. When fully developed, the BIMonAR application will be the first application in Malaysia which provides complete tutorial on sign language. Being born without a left hand and both legs, Ruzimi was motivated to develop this application after knowing that there has been no application in the education system that caters specifically for hearing disability. “In Malaysia, apart from the Special Education Schools (government schools for the disabled children), there are limited options to train able-bodied people to communicate using sign language. “Because of this difficulty in communication, the deaf in Malaysia were being left behind in various opportunities such as pursuing tertiary education and employment, especially in the Malaysian public service,” he said. 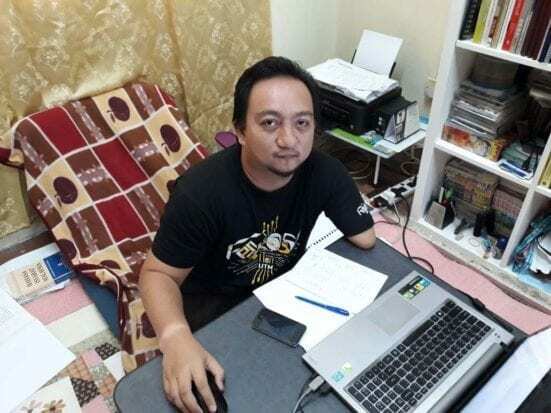 According to this 32-year-old researcher, the number of the disabled people (OKU) in the deaf category who are registered with the Malaysian Social Welfare Department (JKM) is up to 60,000 people but the able-bodied individuals who are skilled in using the Malaysian sign language are less than 20 people. “This is a truly unfortunate fact because, with a total of 60,000 deaf people registered throughout Malaysia, we should have at least 5,000 to 6,000 able-bodied people who are skilled in communicating using the Malaysian sign language to achieve a balanced ratio,” he said. Speaking about the development of BIMonAR’s application, Ruzimi said that he has been devoting all his best efforts to complete this application within the targeted timeframe. “I am targeting by the end of 2018 for this app to be completed and then introduced to the public,” he said. The idea of creating BIMonAR application has led to Ruzimi’s success in winning RM500,000.00 as a business grant through the Skim Permulaan Usahawan Bumiputera (SUPERB) programme organized by Unit Peneraju Agenda Bumiputera (TERAJU), Prime Minister’s Department (JPM) last December 2017.